As you probably know, the Big Game was played last night on Sunday, February 5th, 2017. First, congratulations to New England and their many fans! Secondly, I know a lot of you don’t care about the game itself; it’s all about the commercials! This trailer is just epic. I didn’t think I could want to see Guardians of the Galaxy Vol. 2, but this trailer makes me wish I could go to the theater today! For me, Dave Bautista really steals the trailer with his “I tried” line. I don’t know when or if I will see this movie, but I love the trailer. The voiceover in the style of selling an actual cure with a long list of sound effects is just creative marketing to me and really stuck out. This new series on Hulu, based on Margaret Atwood’s classic novel, looks truly chilling and striking. Frightening in its plausibility, this is a tale that is still relevant now. I can’t wait to give this series a try. Watch the trailer and let me know if you agree. Sure, the Pirates movies are getting more than a little long in the tooth, but I still love this series. This new trailer gives us our first look at Barbossa, Jack, and (more importantly) Will Turner. Will is looking a little like Davy Jones used to. Can’t mean anything good for him, can it? I know I’m cheating on this one a little bit. This trailer didn’t really show us anything new from the X-Men spinoff, but I don’t really care. Every single trailer for Logan has been amazing and this one is no different. I can’t wait to see this movie and I hope you agree. This didn’t make my official top five because it’s not really a trailer. That being said, I couldn’t help but giggle uncontrollably when Lucille smashed that football. Does that make me morbid? Probably. But, in my defense, I was a huge fan of the comics and had been waiting a long time for Negan and love Jeffrey Dean Morgan in the role. 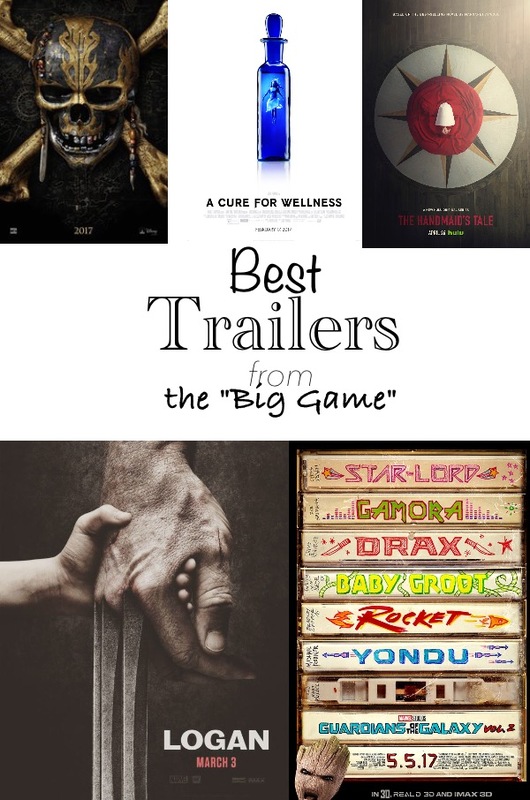 So those are my five (and then some) favorite movie and TV trailers that were shown during the Big Game. What do you think of my choices? Tell me about it on Facebook, Twitter, and Instagram!